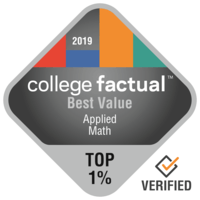 Best Value Applied Mathematics Colleges in the U.S.
Are you ready to jump-start your career with a degree in Applied Mathematics? Find a school that offers you quality outcomes without breaking the bank with this best value ranking. 3,485 Applied Mathematics undergraduate students graduated in 2017 with bachelor degrees nationally. The average salary of an Applied Mathematics grad is $52,199 in their early career and $101,857 in mid-career. However, students report earning anywhere from $45,397 to $64,868 in their early career, and $78,132 to $149,822 in mid-career, depending on the program. Get more for your money by pursuing this ranking of the "Best Applied Mathematics Schools for the Money". These rankings were created to help students like you discover quality and affordable options. We create all of our rankings with outcomes in mind. See the full ranking methodology. Seeking the best of the best? Look into Stony Brook University to get your degree in Applied Mathematics. After getting their bachelor's degree, applied math students generally make an average of $53,198 in the first five years of their career. Situated in Stony Brook, New York, SUNY Stony Brook supplies a safe and sound, suburban experience for individuals. This school's student loan default rate of 3.2% is considerably below the U.S. average of 7.0%. Applicants should not let costs stop them from deciding on this school since 57.0% of students receive school funding. Videos from SUNY Stony Brook could be a great way to learn more about university. It's hard to beat Missouri University of Science and Technology if you want to pursue Applied Mathematics as a major. Rolla, Missouri provides a whimsical small-town ambiance for young people to learn in. Bryant University is a wonderful choice for students pursuing an Applied Mathematics degree. Students who graduate from the applied math program earn an average of $56,157 in their early career salary and $108,141 in their mid-career salary. The destination of Smithfield, Rhode Island, is satisfactory for learners who like a quieter, suburban region. Close to 90.0% of freshmen return to this school for their second year. Just 37.0% of college students graduate on time. Bryant is way ahead of the pack on that mark with a 72.8% on-time graduation rate. Get an idea of what student life at Bryant is really like by seeing a few campus videos. It's hard to beat Elizabethtown College if you want to pursue Applied Mathematics as a major. It is based in the suburban location of Elizabethtown, Pennsylvania. Freshmen are not required to live on-campus at Elizabethtown College. Ranked #27 in Pennsylvania for overall value, we might have expected this college's excellent academic programs to be higher priced. Get a better idea of what student life at E - town is really like by seeing a few campus videos. University of Washington - Seattle Campus is among your top options if you want to study Applied Mathematics. University of Washington - Seattle Campus applied mathematics students make 4.3% more than the average applied math student. University of Washington - Seattle Campus is among the largest schools in Washington. University of Washington - Seattle Campus does not require freshman students to live on-campus. University of Washington - Seattle Campus offers graduate degree programs for those who need to keep going after earning a four-year degree. Learn more and see just how University of Washington - Seattle Campus ranks in other categories. It's difficult to beat Illinois Institute of Technology if you wish to study Applied Mathematics. Graduates from the applied mathematics major at Illinois Institute of Technology get 4.7% more than the average college graduate in this field. Situated in Chicago, Illinois, this school is ideal for learners who flourish in a city atmosphere. At least 100.0% of the teachers at Illinois Tech have full-time hours, so they have lots of time to work with their students. There is an advanced degree program obtainable for those who are intrigued. Take a virtual tour to learn more about Illinois Tech's campus. Rice University is a great decision for students pursuing an Applied Mathematics degree. Applied math graduates from Rice University receive an earnings boost of about 7.5% over the average earnings of applied math majors. Located in Houston, Texas, this university is a good choice for learners who thrive in a city atmosphere. This institution is a good bang for the buck for students in Texas. Applicants should not let costs stop them from deciding on Rice University since 63.0% of students receive financial assistance. Take a virtual tour for more information on Rice's campus. It's difficult to beat Georgia Institute of Technology - Main Campus if you wish to study Applied Mathematics. Students who graduate from the applied math program make an average of $54,708 in the first five years of their career and $111,680 after their first five years of their career. Want a sizable student body? This school has over 20,000 students on campus. If you are considering Georgia Tech, better study hard. The typical SAT score of applicants is 1,410. Given that 22.2% of Georgia Tech's student body originates from outside the United States, you are going to have a lot of chances to learn from students many areas in the planet. If you are interested in finding out more, you can see all of Georgia Institute of Technology - Main Campus' rankings here. Stanford University is a great decision for individuals interested in an Applied Mathematics major. Soon after graduation, applied math students generally earn about $64,868 at the beginning of their careers. Based in Stanford, California, Stanford offers a dependable, suburban atmosphere for young people. Stanford University also has grad degree programs for those who wish to continue after earning a four-year degree. This college features a superior freshman retention rate, with 98.0% of first-year students returning for their second year. Interested in knowing more details on Stanford University's campus? Have a virtual tour. Every student who is interested in Applied Mathematics needs to look into Washington State University. Washington State University applied mathematics students earn 1.7% more than the average applied math grad. With more than 20,000 undergraduates, this institution is one of the largest schools in the nation. Roughly 73.6% of the instructors at Washington State University are full-time and have regular office hours, so they are more available to help. Washington State University offers graduate degree programs for students who wish to carry on after earning a bachelor's degree. Watch some school videos to learn more about what's happening on campus.